Spring millinery generally precedes Nature in its blossoming forth into many coloured flowers. A discreetly arranged little posy of blooms very often form a sufficient trimming for a new toque, or will give that- touch of freshness to a last year's model which will make it pass among the uninitiated as a new purchase. 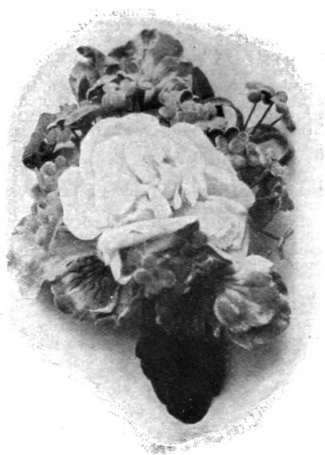 To make up a posy that has a professional air one needs, first of all, some fine green-covered wire, three yards of which can be bought for id. Uncovered wire is sure to slip, unless of the very finest make, and cotton, which the amateur is prone to think will "do," is useless as a substitute. Then the flowers must be arranged in a neat and compact fashion, or they will begin to look untidy at once. The tiny monthly roses, for instance, should never straggle out of the posy so as to show their stalks, but lie flat against the hat. A lovely half wreath of blush roses with their own foliage. This is a suitable trimming for the summer hat be used with good effect, and sometimes little touches of wallflower are introduced. A charming colour scheme is in a knot of dark red rosebuds surrounded by tiny little roses in a pale vieux rose shade. The wee fully-blown monthly roses are also delightful. These can be bought for 6 3/4d. the packet. A particularly smart posy is contrived with three of these in a dark red shade in the centre, about eight in pink and cerise tones around them, with the outer circle of all composed of a single row of rather bright blue forget-me-nots, also at 6|d. the packet. Four of these could be placed at intervals around the crown of a hat, or a single one would probably be enough for a toque. As a rule, it looks smarter not to have an outer rim of leaves, the moss that is attached to these little roses giving all the touch of green that is necessary. 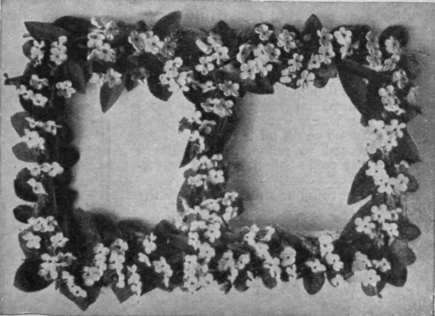 With violets, however, leaves are generally an improvement, as the blossoms are apt to look insipid without a touch of green. A dull rose-coloured rose, or one in pink, or dark red, surrounded by violets, looks delightful. A rosette formed of a full-blown white rose with pansies and forget-me»nots is a useful addition to summer millinery and cornflowers also appear to advantage on a blue tagel toque. With regard to the actual making up of the bunch, the wire should not be used sparingly. It should be wound around tightly, and the loose end be secured firmly by being wound in and out among the stalks. The stalks must be cut off quite short, and, to make the task complete, should be covered with a little piece of green sarcenet ribbon wound round and round and sewn at the end. Fan-shaped ornament or rosebuds and leaves suitable for catching the brim of a toque to the crown. It is mounted on wire row of smaller leaves and a row of pale blue forget-me-nots. Below these again are more small leaves, and, right at the tip, a bunch of the wee pink roses. 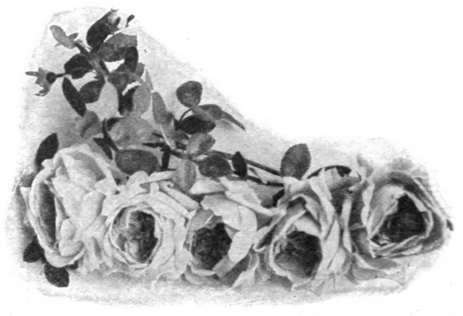 A flower buckle is'quite expensive to buy, but can be made for a little over a shilling. For this a net mount must first be made, stiffened with a thicker wire than for the other ornament. To look well these buckles need to be fairly large, about eight inches long by five and a quarter inches wide. They are charming made of tiny roses or of forget-me-nots. If forget-me-nots are used they should have a pink blossom in each spray, as the effect of all-blue flowers is rather hard. The buckle should not take more than about one packet of these at 10 3/4 d., or two or three packets of wee roses at 6|d. 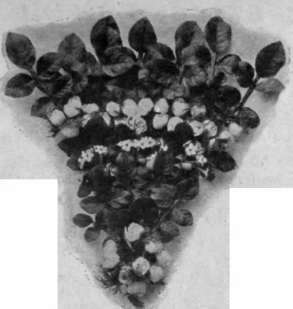 the packet, but the amount required depends on how closely the flowers are placed. They need not be used too extravagantly, and if the net shape is first covered rather sparingly with green leaves - rose-leaves can be used if the correct foliage is not forthcoming - the buckle will look prettier and there will be a saving of flowers. A charming idea is the lace quill or panel edged with tiny flowers and foliage.